Yolanda Baker has been making disco balls every week of her life for nearly 50 years and shows no signs of slowing down. 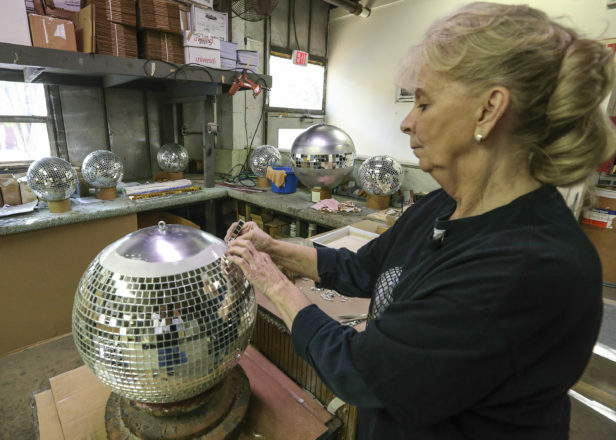 Baker, known as Yo Yo to her colleagues, works for Louisville’s Omega National Products – America’s leading disco ball manufacturer – and has over the years filed orders for Beyoncé, Madonna, Studio 54 and even the Saturday Night Fever film set. As we boogey on down, we might recall that it was on this date in 1934 that the famous Apollo theatre in New York City’s Harlem district (re-)opened as a showcase for black artists. Added to the National Register of Historic Places in 1983, it had been built in 1913-14 as Hurtig & Seamon’s New Burlesque Theater, and designed by George Keister in the neo-Classical style. The Apollo fell on hard times in the 20s and limped along until, under new management, it became (starting on this date in 1934) a mecca of the Swing Era. It featured musical acts including Duke Ellington, Dizzy Gillespie, Chick Webb, and Count Basie, dance acts such as Bill Robinson and the Nicholas Brothers. And though the theater concentrated on showcasing African-American acts, it also presented such white performers as Harry James, Woody Herman and Charlie Barnet during the swing era, and, later, Dave Brubeck, Stan Getz and Buddy Rich, who was a particular favorite of the Apollo crowd. The Apollo’s “Amateur Night,” a Monday-night talent contest launched many storied careers, from Ella Fitzgerald and Thelma Carpenter to Jimi Hendrix (who won in 1964). 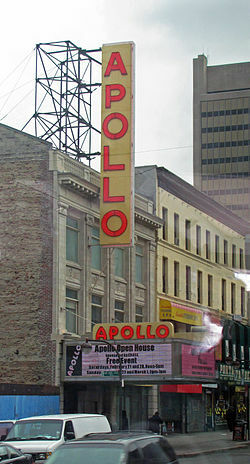 Others whose careers were hatched or given an early boost at the Apollo include Billie Holiday, Pearl Bailey, Sammy Davis Jr., James Brown & The Famous Flames, King Curtis, Diana Ross & The Supremes, Parliament-Funkadelic, Wilson Pickett, The Miracles, Gladys Knight & the Pips, Rush Brown, Stephanie Mills, Dionne Warwick, Bobby Short, The Jackson 5, Patti LaBelle, Marvin Gaye, Luther Vandross, Stevie Wonder, Aretha Franklin, Ben E. King, Mariah Carey, The Isley Brothers, Lauryn Hill, Sarah Vaughan, Jazmine Sullivan, Ne-Yo, and Machine Gun Kelly. Restored 11 years ago, the venue draws an estimated 1.3 million visitors a year. 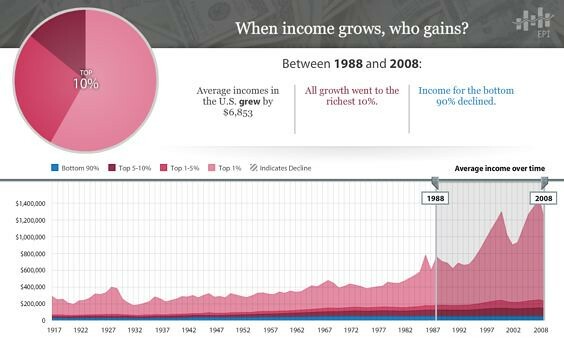 One can use the interactive chart above (which is based on income tax data, and is adjusted for inflation to 2008 dollars) to see how average incomes in the U.S. have grown as between any two years from 1917 to 2008, and how that change was divided as between the richest 10% of the population and the remaining 90%. A newly resilient U.S. economy is poised to expand this year at its fastest pace since 2003, thanks in part to brisk spending by consumers and businesses. One wonders how… indeed, one wonders how long the dynamic that’s defined the last two decades is sustainable in what is fundamentally a consumer-driven economy. As we ponder the different kinds of heart we might celebrate on Valentine’s Day, we might recall that it was on this date in 1967 that Aretha Franklin recorded “Respect” (with her sisters Carolyn and Erma singing backup). 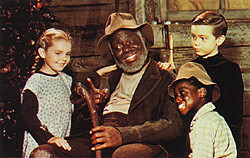 The tune had been written and recorded by Otis Redding two years earlier, and had done well on the R&B charts. But Atlantic Records exec and producer Jerry Wexler thought that the song was especially suited to showcase Aretha’s vocal gifts, and had the potential to be a cross-over hit. He was, of course, right on both counts.